Latest forecast track of Cindy from the National Hurricane Center. As you can see from the graphic above, as of early Wednesday evening, Cindy is expected to make landfall early Thursday morning near Beaumont, TX, or along the TX/LA border. It will be a moderate tropical storm with maximum sustained wind near 45-50 mph when it makes landfall. From there, it heads north up the TX/LA border then begins a right turn Thursday night, heading into southern AR, That right turn continues, moving what will likely be Tropical Depression Cindy, over the Mid-South, if not Memphis proper, on Friday around mid-day. There are some model discrepancies on the exact track of the center of the low and the timing, but it will be during the day Friday. 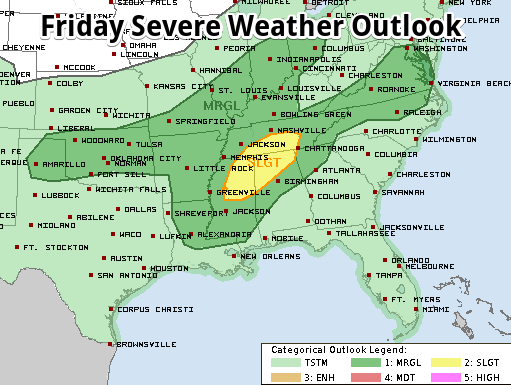 The effects here in the Mid-South will primarily be those that were problems to our south today - some gusty wind, not-insignificant rainfall which could lead to some flash flooding, and as with any landfalling/remnant tropical system, a few strong storms that could produce brief tornadoes. We'll take them one at a time. Wind has not been a major factor even while Cindy was a tropical storm today. Strongest wind of up to 40-50 mph was primarily right near the center and in convective bands well removed east and north of the storm. Cindy will weaken after landfall, but we'll see breezy conditions (10-20 mph, some higher gusts) through Thursday night. On Friday, as the low approaches and depending on its exact track, some areas could see sustained wind of 20-30 mph with a few gusts to 40+ mph, mainly in convective (thunderstorm) bands and near the path of the low. By Friday evening, any strong wind will subside back to the baseline of 10-20 mph. Widespread power outages are not anticipated, but with a slightly weakened grid due to remaining tree limbs on lines, etc. from recent storms, sporadic or scattered outages are possible, mainly Friday. The primary threat from Cindy is, and will continue to be, periods of heavy rain and the potential for flash flooding. Timing of any "bands" or "slugs" of moisture is very difficult more than several hours out, so trying to pinpoint exact times of when they will occur is borderline futile. Suffice it to say, rain chances will be high from late tonight until the system passes late Friday, however it is not expected to rain hard the entire 2-day period. Overall, rainfall totals could vary quite a bit from one place to another but are expected to generally fall in the 2-3" range between tonight and Saturday morning with some areas seeing up to 5". Flash flooding and urban ponding/flooding are possible. Flash Flood Watches are not currently in effect but I put odds at better than even that they will be before Friday. Our area is under a Moderate Risk of flash flooding for the Thursday night/Friday period, as shown below. 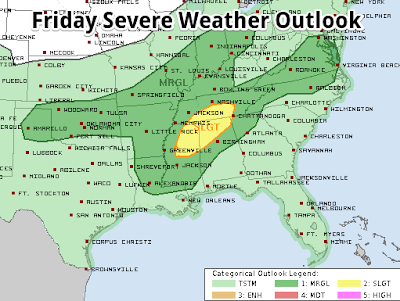 On Friday as the low passes near the metro moving northeast, the most favorable position for brief tornadoes will be in the southeast quadrant of the storm. 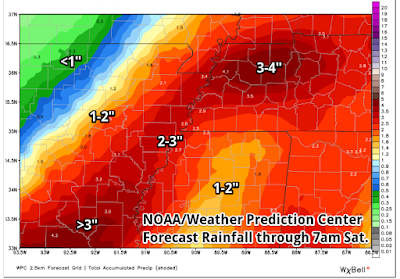 If the low passes to our north, Memphis could be in that quadrant. If it passes just to the south or overhead, the favored area will be to our south. 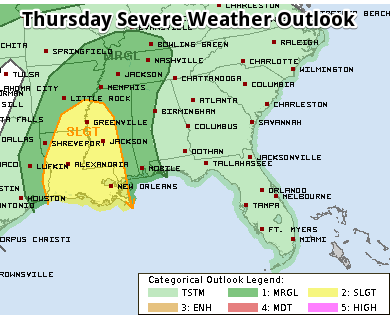 Currently, the Storm Prediction Center, based on the Hurricane Center track, places the Slight Risk south of Memphis with the metro in a Marginal Risk once again. That could change and will bear monitoring. Overall, the probability of tornadoes also will go down a bit from Thursday to Friday as the system weakens in general. As a last comment, the tornadoes associated with weak remnant systems in general are not the monsters we see in the Plains or Dixie Alley associated with supercells. They are more akin to the brief spin-up's that are possible with a squall line moving through, but we still need to prepare for the possibility that they could occur, and probably with little notice. By Friday night, it appears the worst will be over with perhaps a lingering shower that lasts until Saturday morning. Most of Saturday looks like it could be dry (though precipitation may hold back a little longer than current thinking) and Sunday introduces another conundrum, as computer models have fought like pre-teen siblings over whether an upper level system brings additional rain chances. Right now those chances appear fairly low. Stay tuned. 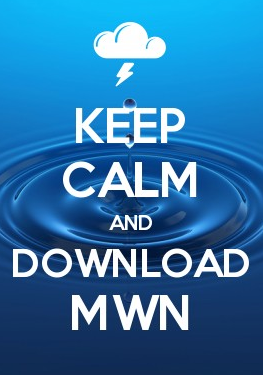 In the meantime, be sure to follow us on social media for the absolute latest on this dynamic weather situation; download the MWN app for radar, currents, the MWN Forecast, and our social feeds as well as StormWatch+ optional severe weather alerts; and check out the MWN Tropical page (optimized for desktop browsing) with more information on the current status and future of Cindy! All social and app links are listed below.